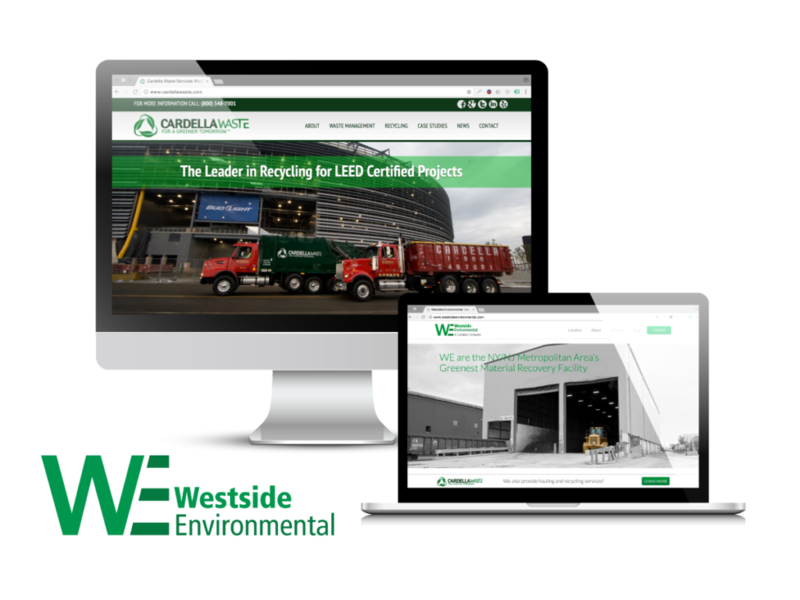 Cardella Waste has been in the waste management industry since 1952, and today specializes in fulfilling LEED recycling requirements on construction projects throughout New York and New Jersey. The company acquired Westside Transload, the first rail-based material recovery facility, in 2013 and rebranded it Westside Environmental. Cardella turned to Crearé Web Solutions in 2012 for monthly website maintenance and to handle a variety of other tasks, including website updates, new content creation, search engine optimization, and social media management. After acquiring Westside, Cardella needed to create a logo, marketing materials (folders, flyers, business cards), and a new website to rebrand this company under the Cardella umbrella. The company also sought to update its Cardella Waste website to ensure that the two websites are reflective of one another going forward. Crearé Web Solutions reorganized and simplified Cardella’s existing website to make it easier to navigate. Our team created content that shows the depth of the firm’s services and expresses Cardella’s commitment to environmentally friendly waste management, a point of distinction. To enhance SEO on the site, we developed a search campaign with Google to optimize Cardella’s presence on Google and across Google’s affiliate channels. We continue to manage both websites on a monthly basis, adding content, promoting different services and making processes at Cardella more streamlined, including creating an employment form as well as a dumpster rental form to make the best use of employees’ time and help customers more quickly.